The question repeatedly asked in this connection is whether or not the heptachloro-dioxane discussed could be classified as an insecticide was briefly addressed in passing and will be answered below. Between 1943 and 1947 the author synthesized more than 400 halogenated compounds for systematic research on “constitution (configuration) and insecticidal activity” with the aim to detect new active representatives in this class (3, 4). Among these compounds was also a series of previously unknown halogenated 1,4-dioxanes (5a,b): the heptachloro-dioxane (I-), mentioned in the title together with its octachloro derivative [(X) in Table 1] and a hexachlorodioxen (II) resulting from I- by HCl-splitting [1944 (5a), 1947 (5b), Plate 1 (5c)]. In the beginning of the 1950’s W. Stumpf, of the University of Heidelberg, was believed to have isolated two I-isomers as he described in his habilitation paper and in (6a,b), but he was mistaken as we could confirm within 40 years research about dioxane-chlorination products: Only one I-isomer, namely the one of mp 57°C, can be isolated by chlorination of dioxane and of its chlorination products. A further error in the Heidelberg publications (6a,b) is the statement that I- can be considered as a new insecticide: nil return! Heptachloro-1,4-dioxane mp 57°C (I) cannot be classified as insecticide comparable with DDT, Gammexane, M 410. I- and its analogues are only of academic interest, for instance for systematic research “dependency of insecticidal activity of spatial structure” : Table 1 (5b). 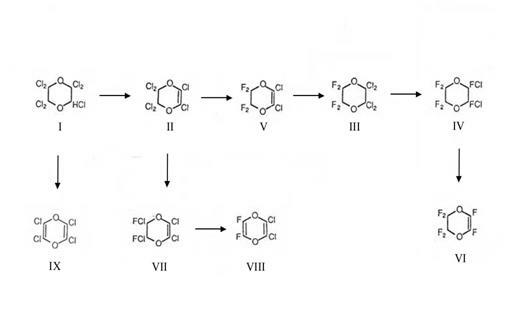 Via the I-dehydrohalogenation product II the heptachloro-1,4-dioxane mp 57°C (I) offered the entrance into the chemistry of F- and Cl-substituted dioxanes and dioxenes: Plate 1 (5c). The comparison with gammexane creates the impression that heptachlorodioxane is an insecticide of significance. The result of their experimental tests was "The pictures of poisoning caused by DDT and heptachlorodioxane show a certain conformity." n : 1,5211 [(657) in (1)]. I mp 57°C had never any practical meaning for Pest Control (7-11) as you may think reading older publications e.g. (6,12). I- mp 122°C does not exist (1,2). About preparing superchlorinated 1,4-dioxanes: C4HO2Cl7, C4O2Cl8, "hepta oils"
About preparing and identifying 10 Cl-substituted 1,4-dioxanes, -dioxenes [and subsequent products (Tab 1)] as well as testing for contact-insecticidal activity (direct chlorinations of 1,4-dioxanes and 1,4-dioxane chlorinated products); heptachloro-1,4-dioxane from mp 56-57°C, octachloro-1,4-dioxane from mp 110-112°C. 2 Contact poison test apparatus II: Avoids respiratory poison effect by directing the air stream through closed, parallel sintered-glass nutsch filters. Insects and test substances: in each filter there were 30 Calandra granaria on disks containing the test substances (applied in an acetone solution of defined concentration, dried on needle stands). Further experimental details to Plate 1 in (15). There Special Part at X 3.2. The mentioned manuscript was sent confidentially to Prof Dr S Takei, Kyoto Univ. Copy of letter in (15). Critical comments during discussion of lecture by W Stumpf on "Dioxane-chlorinated products as insecticides"
It seemed very improbable, after our extensive experience in the field of Hal-substituted dioxanes (and cyclohexanes), that a symmetrically build octachloro-dioxane mp 110-112°C (X) would melt at a lower temperature than the so-called heptachlorodioxane mp 122°C. We prepared already in 1944 and 1948 heptachloro-1,4-dioxane mp 57°C and X (5a,b). Results: I without practical meaning as insecticide. I geliefert vom Autor, FU. 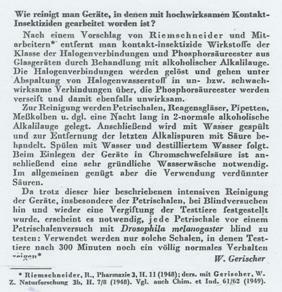 In a reproduction by our staff with experience in handling insecticides, especially Ms. W. Gerischer, the test method used for determining the contact-insecticidal effect of the investigated compound in "wooden boxes with films making time-consuming cleaning superfluous" turned out to be totally useless as far as the issue of "contamination" was concerned. Removing the last gammexane residues from glass vessels requires a treatment we tested over many years and described to many interested users upon request. At the time, we did not always succeed in cleaning wooden containers completely. Gammexane used for comparative purposes would have required working in glass vessels at all times (13). In this case, the investigators compared a compound with a weak effect with the highly active gammexane, forgetting that gammexane was also called "the atom bomb in the insect world". English translation in PROJ X 4,1a in (15).